Whether it’s to write that book, lose 20lbs, make more money or find a new job, it’s easy to lose the focus and motivation you need to stay on track unless you are truly emotionally attached to your goal. If your goal seems like too much work, too far away and out of reach, you’ll lose sight of it, lose your passion and run out of steam. Before you know it, your goal gets put on hold… AGAIN. 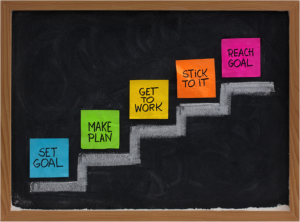 So what’s the secret to setting goals? First of all, you’ve got to experience what it feels like to succeed. You’ve got to FEEL your best FUTURE and walk around in the shoes of your most successful self so that it feels real, it feels possible and you get a taste for how good you can feel. When you merge your consciousness with this elevated state, you become truly inspired by your goal. The word inspired derives from the Latin inspirare, meaning to breathe in. And that’s exactly what you need to do – breathe it in until it embeds itself deep in your subconscious. Here’s a simple and effective NLP technique to help you set your inspirational goal, tap into that powerful subconscious part of your brain and feel your best future every day. Find a quiet spot, close your eyes and take a few meditative breaths until you feel grounded. Bring your goal into your mind and play a movie of yourself having achieved your goal. Notice all the details of how you look; how you stand; your smile; the light in your eyes; how you feel about where you are now and what you have achieved. Make the image bigger and brighter and your feelings more expansive. When you’re ready, step into this image feeling how good it feels having achieved your goal and walking around in this new future you. Anchor in these feeling by squeezing your thumb and middle finger together. Ask yourself: What are the positive after-effects on your life that result from achieving this goal? What positive emotions do you feel? Focus on this. Let this be the inspiration that drives you. Replay this movie daily and it will fuel you with all the energy you need to reach your goal so that no matter what stands in your way – you’ll find a way to make it happen. If you want to learn how to Life Coach yourself or others then book a place on my one-day workshop: Life Coaching using GROW and create an inspirational goal for yourself! Book now to get an Early Bird discount – there are limited spaces.